Elm Creek Animal Hospital is proud to serve Champlin, MN and surrounding areas. We are dedicated to providing the highest level of veterinary medicine along with friendly, compassionate service. If you have any questions about how we can care for your pet, please don’t hesitate to call us at (763) 427-5150. Thank you! This vet clinic/hospital is absolutely top notch from the receptionists, to the Vet techs to the Vetranarians! Everyone is so kind & soley interested in the best possible care for your fur babies. My dog visits Dr. Duke. He is very in tuned with what my little girl needs to live a happy, healthy long life. So important to my husband and I since she is a huge part of our little family! I would give them 10 stars if that were an option! 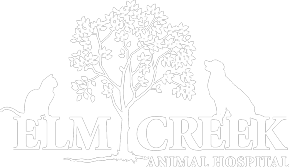 We have been using the Elm Creek Animal Hospital for well over 30 years. We have found the staff to be very helpful and friendly when dealing with our pets annual exams and life ending decisions. Our most recent visit was for an annual exam and the staff was extremely helpful in dealing with a dog that didn't want to have anything done. While it took 3 visits to complete the exam, update shots and clip his nails Dr. Blum and her staff were extremely understanding and concerned about our dog. This was first time I have had any dealings with Dr. Blum and am extremely pleased with her professional manner and would not hesitate to recommend her and the staff at Elm Creek Animal Hospital that is looking for a reliable vet. We love this place! We absolutely love Dr. Blum, but really the entire staff is always so helpful, kind and knowledgeable. They always treat our pups with such compassion and love. So happy to have such a great clinic to take our pups to! First time to visit Elm Creek, and my Rudi was so comfortable. Dr. Duke was so gentle with him. Rudi is usually very skiddish, but Dr.Duke was calming and talked Rudi him while doing the exam. This is the first time any vet has been so caring and gentle with my bun. Definitely making Elm Creek our permanent place to get our fur babies checked out and cared for. Thank you so much Dr. Duke!! !